is higher than its shoulder, its trunk has only one finger-like bump at the end as opposed to two, and it has four toenails on its hind feet. 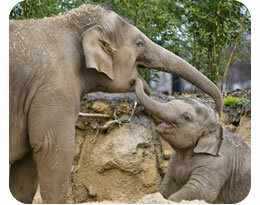 An elephant’s trunk is formed from the nose and upper lip. It is used for breathing, smelling, touching, communicating, washing, dust-bathing, picking up objects, eating and drinking!